Whenever any court verdict or decision goes against the synchronised syndicate of greedy vehicle owners and careless transport workers, they call unjustifiable strike for indefinite period of time holding the mass commuters hostage. Their voracious and reckless attitude is responsible for continuous deadly accidents that the country is experiencing every day. But due to their organised display of power and silence of the concerned authorities regarding the matter, the voice of other stakeholders, more particularly the ordinary passengers, remained unheard until an unprecedented student demonstration took place after the death of two students of Shaheed Ramiz Uddin Cantonment College and injuries of several others on July 29 followed by a crazy race between two buses of Jabal-e-Noor Paribahan in capital’s Kurmitola area. In protest of that fatal accident students of schools and colleges occupied the streets enchanting the slogan ‘we want justice’ and later made the vehicle drivers bound to follow traffic rules. Consequently students of different public and private universities joined them supporting the movement. Initial peaceful protest turned violent when police went hard on the students using teargas shells and charging baton. In the meantime a group of goons, mainly activists belonging to different associate wings of ruling party, misbehaved with the students, attacked them and assaulted journalists on duty with sticks, iron rods and machetes under the very nose of police. After nine days of continuous agitation, students returned home on 6 August following the approval of the draft of Road Transport Act 2018 by the cabinet. Meanwhile police arrested protesters indiscriminately. On the other hand, they turned a blind eye to the activities carried out by the hooligans wearing helmet who were involved in attacking students and journalists. Police have completely failed to arrest those perpetrators despite the fact that their clear photos were published in different newspapers and online portals while the videos were telecast on various TV channels. Law enforcement agencies arrested 102 persons, including 52 students, in 53 cases that they filed over the accusation of carrying out vandalism, launching attacks on policemen and spreading rumour through social media sites during the student protest. Most of the students were detained from capital’s Rampura and Pragati Sarani on 6 August. Detectives didn’t feel tired to reach their villages for scrutinising whether the accused have any political identity or not. Albeit most of them got bail before Eid-ul-Azha, they and their family members had to go through a terrible experience. Many of them have claimed that they became the victims of arbitrary arrest by police. For example, Asian University’s student Saber Ahmed said that when he was arrested, he was going to a restaurant for having lunch. American International University-Bangladesh’s pupil Amimul Ahsan told he was detained while he was returning home after attending his semester final examination. According to East West University’s student Mohammad Bayejid, he was captured when he was going to the university library for taking preparation ahead of his semester final examination. All of them have stated that they didn’t know the reason of their detention. These students also complained that police ceased their mobile phone and they initially didn’t allow them to communicate with their guardians, friends and lawyers. Police even didn’t hesitate to torture them while they were in remand to collect information about their political involvement. Akhter Hossain, one of the lawyers of these students, has said that police in their First Information Report mentioned that they were miscreants, but they didn’t state that they were students. As a result despite submitting all necessary papers regarding their studentship they failed to manage bail and consequently some of these students couldn’t attend their semester final examination. Being informed by their friends their guardians rushed to the capital and kept running restlessly from police station, lawyer’s chamber and court to central jail. During their children’s time in custody they were stressed and went through a tense time. Some of these guardians without having any relative’s house in Dhaka had to stay in hotel, eat in restaurant and spend a significant amount of money for managing lawyer and fulfilling other purposes. Though the students got bail, they will have to go through a long process to complete all the necessary procedures of the cases as it appears that the government will not withdraw these cases. So, they will have to spend more time and money for that. One month has gone since these traumatic incidents stupefied the whole nation. 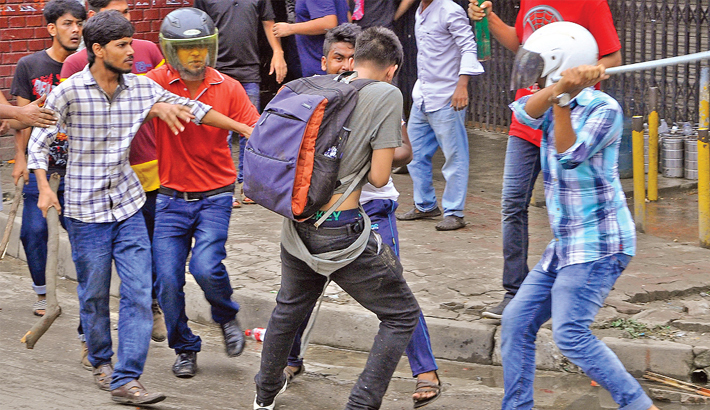 Home Minister, Inspector General of Police and Dhaka Metropolitan Police Commissioner already have stated that they directed the concerned authorities to arrest the hooligans who attacked students and journalists and police have been working to capture them. But law enforcement agencies made no significant progress in detaining the perpetrators in the last 30 days. They even haven’t succeeded in identifying the assailants let alone capture them. It seems that all their dedication and efficiencies are directed towards the task of arresting the students involved in the road safety movement, but they have failed to show their minimum expertise when it comes to taking actions against the attackers on protesters and journalists. This failure of police to bring the hooligans to book raises reasonable questions about their cordiality. There is a perception that police are not arresting the miscreants intentionally as they know about them and their power. And there is logic behind this argument as in our country no one has the audacity to attack on students and journalists carrying sharp weapons in broad daylight in front of police other than the people who believe that they are beyond the range of laws. The harsher part of the reality is when a country’s police force remains supine despite seeing that a group of thugs is attacking some young protesters and journalists, then if anyone expects that those perpetrators will be detained by the same force, it appears that he/she lives in a utopia. Well, the arbitrary arrest of protesters involved in the road safety movement and unwillingness to detain the miscreants who attacked the students and journalists is a clear act of discrimination by the law enforcement agencies. This is also an obvious violation of the constitution as according to the Article 19 (1) of the constitution of Bangladesh, “The State shall endeavour to ensure equality of opportunity to all citizens.” And the constitution also mentions in its Article 7A that if any person, by show of force or use of force, violates any article of the constitution shall be sentenced with the highest punishment prescribed for other offences by the existing laws. But in a state where even the law enforcement agencies show a discriminatory attitude while implementing laws who will take action against the people who breach the constitution and its articles? The most important question that comes to someone’s mind after all these occurrences is - what message have the law enforcement agencies provided through their biased role? What will be the impression of the young protesters and journalists about the rule of law in this country after such shameless partial treatment? These incidents have surely sowed the seeds of latent discontent among the mass people. Our policymakers should give serious thought to this issue. Otherwise such lawlessness may instigate an outburst which may invite more desperate anarchism and destabilise the overall situation of Bangladesh.